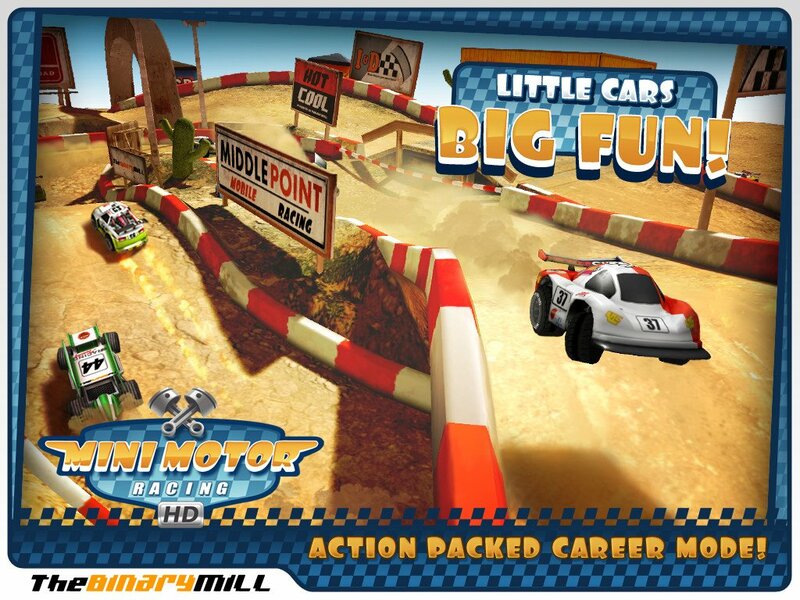 The Binary Mill’s Mini Motor Racing a no brakes allowed, pedal to the metal top-down racer. From the the moment the lights go green, it’s “engines go” as you race around some truly stunning looking tracks. The dust is flying and so are the other cars as you try to nudge, boost and smash your way to the head of the pack. With no brakes, the game quickly becomes a matter of mastering steering, drifting and well-timed use of your limited nitro boosts. There are additional nitro and money pickups that randomly appear throughout the course. The money can be used to purchase new vehicles or upgrade the specs of your existing one. A number of steering options are available, but I’ve personally settled on the tank-style controls (separate clockwise and counter-clockwise turn buttons), which feels very natural and responsive. Mini Motor Racing features over 20 different track layouts (and their mirrors), there is even a cool Fruit Ninja inspired track. Add changing day/night and weather conditions and the total number of unique tracks is rather high. The level of detail on these tracks is quite breathtaking, allowing you to see the dust flying as you make your way around the dirt tracks. Simply put, this game really looks amazing! The single-player Career mode is massive and you can play with up to 4 players over Bluetooth or local WiFi. There are also Game Center achievements and leaderboards as well as the ability to mirror races from your iPad 2 to a TV screen (via AirPlay). Unfortunately if you want to play on both your iPhone and iPad you’ll have to shell out twice for the game (or 2x the iPhone-only release…yuck) since it is not a Universal app. So I cannot comment on how it plays on the iPhone, but I’d imagine it’s just as much fun. Hopefully The Binary Mill will see fit to make the current iPad-only release a universal app sometime in the future. I cut my teeth in the arcade playing a lot of Super Offroad, so top-down racers have always held a special draw for me. 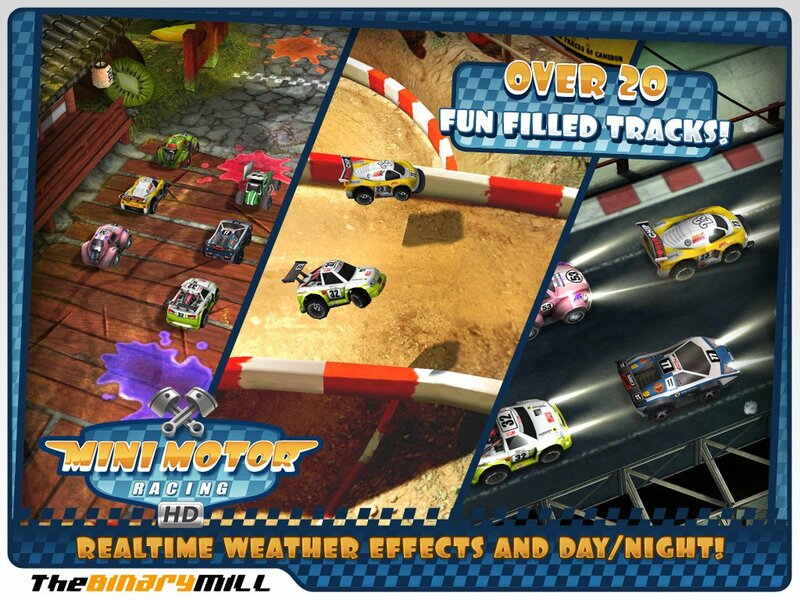 Mini Motor Racing HD delivers the goods on all fronts. Amazing visuals, excellent physics engine, car upgrades, achievements and leaderboards, all the hooks I need to keep me coming back for more laps.